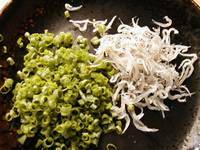 Obachan's Kitchen & Balcony Garden: Is My Tamagoyaki Burning? Here you go! Today is my personal "Is My Tamagoyaki Burning? 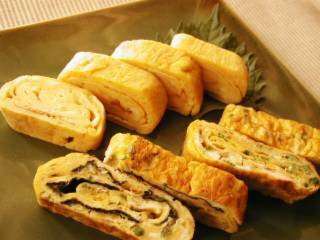 (IMTB)" day, and I’m posting 2 Tamagoyaki recipes for pinkcocoa and those who might be interested. 2 to 3 drops of soy sauce .... Do Not add too much!! How to cook: Basically follow the instruction in the page linked above. Just one thing to add: it helps to use kitchen towel soaked in veg. oil to apply the oil before pouring in the egg mixture 2nd and 3rd time. You can omit dried baby fish if not available, or substitute with something else. You can actually play with tamagoyaki, adding whatever you like and inventing your own versions. I added some nori (dried, paper-like seaweed) to the savory one. See the ones in the photo on top with dark lines inside? Honestly, I didn’t like the taste of this nori in Tamagoyaki very much. 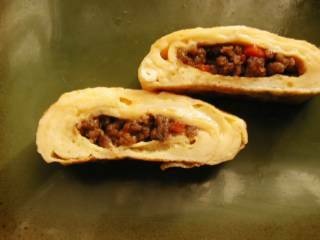 Niku-miso (ground meat seasoned with sugar, soy sauce, ginger and miso) rolled in the sweet tamagoyaki. And here’s the recipe for the Niku-miso, in case someone gets super-curious. In a frying pan, heat a little veg. oil. Sautee the meat and minced vegs. Add salt. Add other seasonings. (When adding Miso, dissolve with Sake and Mirin in a bowl first and add into the frying pan.) Heat until the water evaporates. This niku-miso really comes in handy when I’m too tired to cook. I can just spread some of it on warm, cooked rice and eat a bowl of rice without any side dishes. Pretty helpful on my lazy days. So, Pinkcocoa, I guess the seasonings you have there are different from ours. 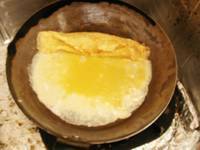 Please make necessary adjustments and enjoy making this Japanese-style omelet! Alright, I will do a IMTB on my blog once I succeed in making tamayoyaki as beautiful as yours! It's not going to be that soon though. :-( I am moving houses this whole week, so no kitchen to use yet! I forgot to ask if you are alright from the earthquake!! I hope you are not affected in any way at all!! Thanks for your concern, pinkcocoa. The disaster site was far away from where I live now, so I wasn’t actually affected. But it brought back the memories of the Great Hanshin Earthquake (I lived near Kobe at that time), and made me feel almost sick all day. I’m OK now. Hi Obachan, it's a relief to know you're far from the epicenter...Also, I can now relax whenever I crack open a dashi-no-moto powder pack. It's ok, Obachan uses it too! It adds a very distinct flavor, I love it for dipping sauces. nice photos and looks easy to make.Thanks! btw, I have almost all the ingredients you have listed except for sake and ajinomoto :p I do have a bottle of Japanese cooking wine though. > drstel --- Oh? 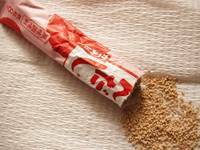 Do you feel hesitant to use dashi-no-moto powder? Don’t worry. A good many of us use it here in Japan, even the professional cooks at the Izakaya pub I work at. Thank YOU for visiting my blog and leaving a nice comment :D Hope you keep coming back. Wow, great recipe, I made them all at once for a party, Japanese themed party, and everyone LOVED them. Thank you so much! hey! awesome blog. You inspire me to make all kinds of food. One of these days I'll try all your tamagoyaki recipies. And I'll probably get a tamagoyaki pan. great recipe. Actually, I came here searching for information about nikumiso (which I tried yesterday for the first time, at an izakaya), and was pleasantly surprised by your page. Of course, I already tried your "nikumiso tamagoyaki", and though it didn't look as nice as your version, it was delicious. Thanks again. Thank you, Jon, 2ndmouse, Alan and Kai. Sorry I didn't respond to you guys in time. I'm terrible with taking care of my older posts -- I mean, comments to my older posts. But I just want you to know that I really appreciate your visits and comments.